A few weeks ago I wrote a post about my upcoming solo gallery at this summers Festival of Quilts. I’ll be exhibiting new works from three connected series. The newest of the three is inspired by the evolution of the print and publishing industry as it has responded to changes in demand and in technology. As with all of my recent work the ideas evolved in my head and at the bench whilst I was busy working on other things - as I said last time I don’t sit round waiting for the muse! So here is the story of a series that I am calling ‘Print’. Last summer I took a few days out from preparing my studio (and myself) for teaching to do some breakdown printing. I set myself the challenge of just using black thickened dye in a squeezy bottle to create lots of different grids. I had sort of started thinking about writing my first book and thought this would be a good starting point. I also wanted to create a small breakdown printed quilt to use on my stand at last summers Festival of Quilts. I wasn’t thinking ‘ART’ but as I started cutting into my printed fabrics I was started thinking about the print industry and my connections with it. I made a small quilt which I called Process Colour #1. 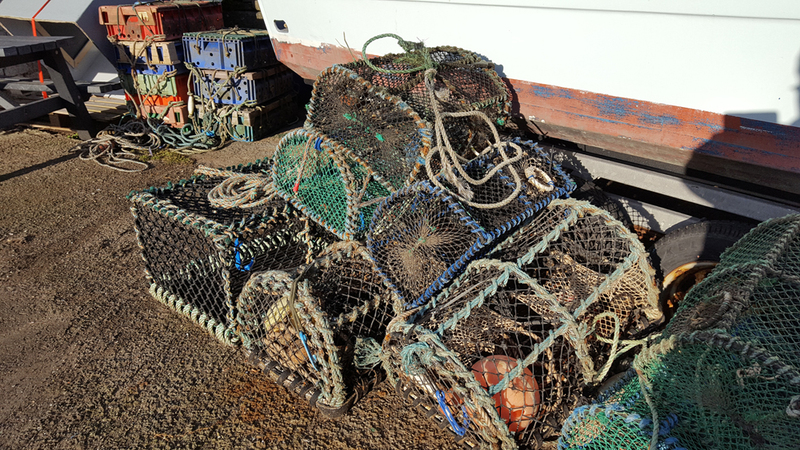 And went shopping for some old wooden print blocks which I thought I might try to incorporate in ‘something’ … no firm ideas of what but wheels had started turning in my subconscious. 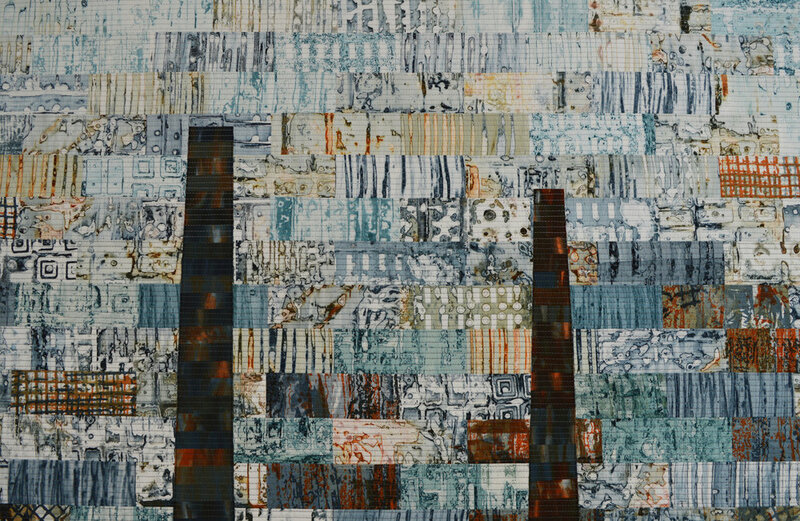 A couple of months later and everything seemed to come together in my head … In my old corporate life I was involved in printing tufted textiles on an industrial scale, in my art life I printed my own unique fabrics. I sometimes use thermofax screens which utilise old technology from the 1950’s. My daughter and her partner have long been involved in the self-publishing / zine movement (check out Good Press). I had spent the autumn trying to get my husband to throw out some very old Gestetner printing supplies 30 years after he used a Gestetner duplicator to print his own zines. And now I was going to self-publish my first book (Breakdown Your Palette). So many connections. And there is so much history when you look at the print and publishing industry. So many changes in technology. 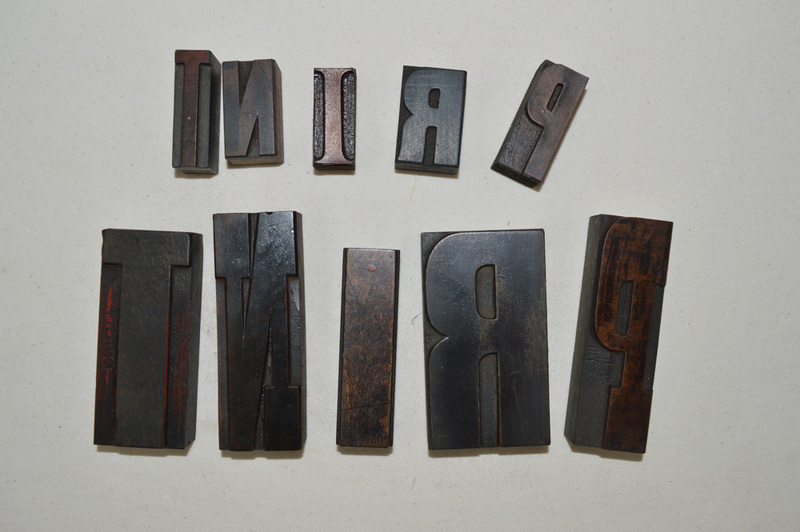 Wood block printing to movable type. Printing presses to lithography to inkjet and digital printing to 3D printing. The written word being accessible to the privileged few to mass publication to the growth of the internet and ebooks. And so I spent another week printing more fabrics. Just using black thickened dye but incorporating embedded wooden print blocks with my grids. Playing with new ideas. Auditioning fabrics. Making a sample utilising thin strips. Promising but still not quite right. All more fuel for my mind to mull over. At some point I decided that I would create pieces using the same ‘brick wall’ background as I wanted that connection with my Ruins series. And sampled this as a piece for my Cloth in Common group. In this quilt I stitched the word ‘offset’ on top of a background made using my breakdown printed fabric. Definitely going in the right direction. Which is just as well as I need to make pieces for the exhibition. In my next post I will share the process for making my first large scale piece in this new series. My ideas will continue to evolve as I make each piece …..
A very quick thank you to everyone who came to see me at the Knitting and Stitching Show at Harrogate. And a quick hello to those of you who signed up to receive this blog by email! My head is a tangle of new ideas inspired by the conversations I’ve had at the show and the responses to my stand. This is all still new to me and I have so much to learn. And so much that I want to do in the coming weeks and months. Watch this space but needless to say that it involves breakdown printing. It was also lovely to meet Alice Fox and Janet Gilbert who were demonstrating in the Art in Action space and to walk around the different galleries. Exhausting but fun! And now I need to make up a batch of print paste …. I’ve just finished setting up the studio for this weekends classes with my day a month Introduction to Surface Design students so it seemed like a great time to tell you about my new course - Creative Surface Design which starts in September 2019. I have developed the course for those of you who have had exposure to lots of different surface design techniques and have a head full of ideas but are not sure how to transfer ideas into finished cloth. The course will be run over 5 weekends spread over an 8 month period. I’ve chosen this format rather than a day a month as being able to leave work on the bench and come back to it the next morning allows for deeper exploration of an idea; it allows you to take your time rather than hurrying to finish. Because I am ‘me’ the course will start with a focus on colour and the power of using a restricted colour set or family. There is a loose structure for each weekend but the exact content will be largely driven by the individual students. I’ll give demonstrations as needed but I am assuming a basic understanding of dyeing and printing techniques. I’ve mentioned before in this blog that I’m not a ‘sketchbook’ type of person as I tend to work directly, intuitively onto fabric with a lot of my design process happening in my head. But I do keep a journal where I write down ideas, and importantly, where I critique my own work. I will be encouraging students on the Creative Surface Design course to keep some form of personal record - whatever form they are comfortable with - and will have a one to one review with each student each weekend to support them as they develop their ideas and their own way of working. All the details are on my website. Or, maybe you can come see me at the Knitting and Stitching Show in Harrogate, 22 to 25 November, stand TG626! I have an itch. I can feel it growing inside of me, gaining momentum. It’s at the edge of my consciousness now whatever I’m doing. It needs scratching! Yep, all the ideas about a new series of works on the printing and publishing industry that have been brewing in my head for weeks have started to come together. This is how I work. I don’t use sketchbooks when developing new ideas but I do like to have something pinned to my design wall or sat on my desk that is always there, in the corner of my eye, as I work on other things. I started thinking about printing and how it has, as an industry, changed and continues to change when I printed some fabrics using simple grid based breakdown screens in July. I made a small quilt called Process Colour for my stand at Festival of Quilts expecting it to be a one-off. But I don’t think it’s going to be. Actually I know it isn’t going to be. I liked how the simplicity of a grid become complex it broke down. I liked printing in only black. I cut some thin strips of the printed fabrics. There is no text but they somehow remind me of newsprint. And so my mind has continued to churn ideas around. 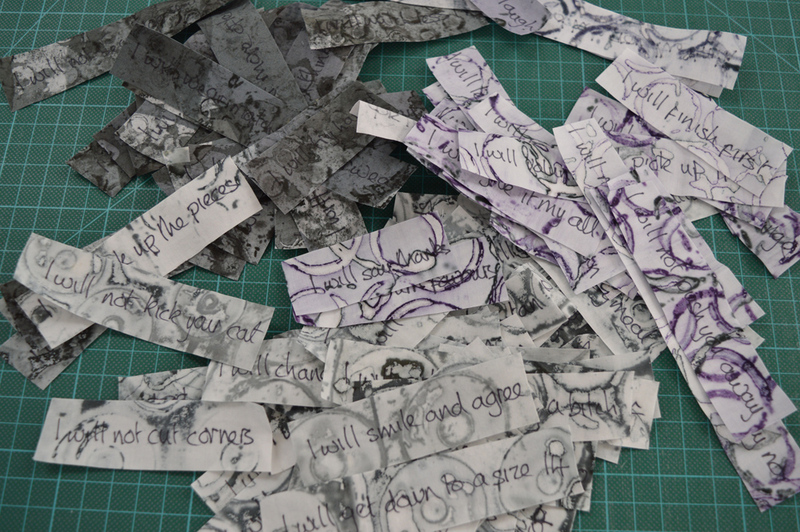 I thought about introducing text on top of some of the fabrics using old wooden print blocks. I wasn’t sure how but I’ve had the blocks sat next to my computer for a while now and they have been the catalyst that has caused an ‘idea’ explosion in my head. I need to get the ideas out. I need to play. I need to print! Cut adrift in a winter wonderland. It has been that time of year again when I join 12 other textile artists (and good friends) for a 5 day retreat at Rydal Hall in Ambleside. No husband. No kids. No cooking or cleaning. No sitting in traffic. No work. New CD's in the car for the drive up. A new piece of work to stitch. Books to share. A short period in which to focus on making whilst eating well and laughing often. It snowed on the first night. The view from my bedroom window was truly spectacular. 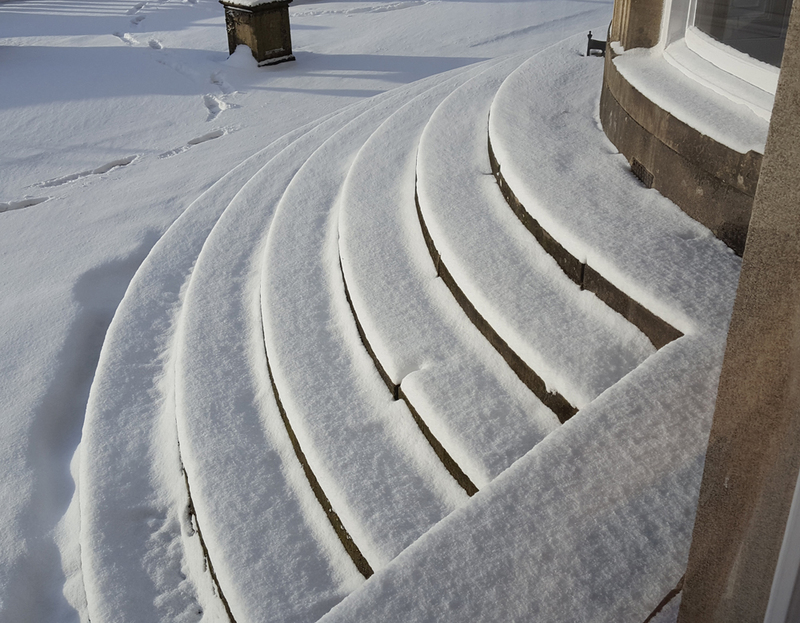 At breakfast I looked through the window at pristine snow on stone steps. Afterwards I opened the front door long enough to be grateful that I didn't have to go any further. I retreated to the work room to stitch. And stitch. And stitch. Cozy and warm. Grateful for what I have but more aware than ever that not everyone lives in wonderland. Some artists, like Linda Syverson Guild, have such wonderful views from their studio that it surprises me that they get any work done! Others, such as Terry Aske have beautifully organised studios with their fabrics and threads arranged rainbow style. I am lucky enough to have a good sized study but I am definitely jealous of Susan Webb Lees' space. Big with lots of different tables and surfaces. Others have small spaces that force them to keep tidy such as Eileen Williams. Most of the photos show tidy studios but Uta Lenk sent a photo of her studio in use. How does she produce such wonderful work from the chaos? One thing that did surprise me was the lack of 'wet' studios in the gallery. No photos of messy print benches or dye buckets. SAQA want more photo's via Instagram and #saqaartstudios. Maybe I should send them some of mine next time I have a printing session! Not many words needed. 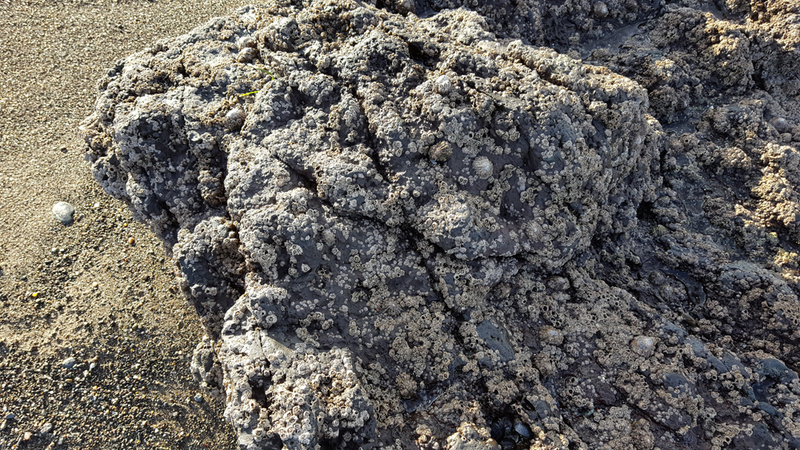 A beach that is more rock than sand. 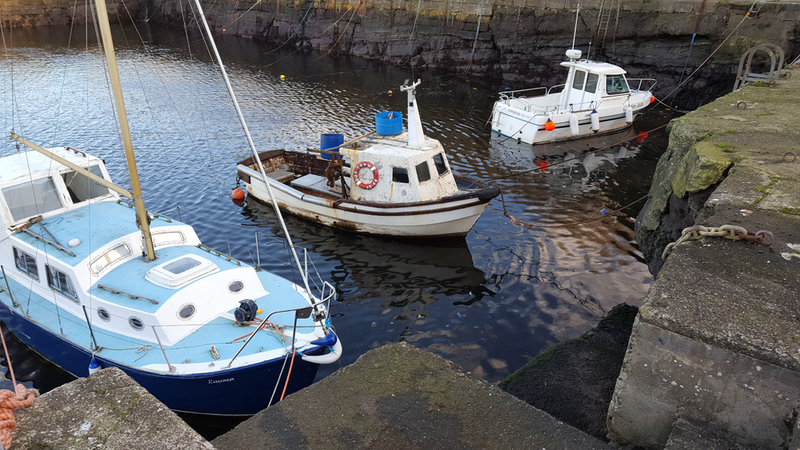 A stone harbour with boats that look too small to conquer the waves. Views of snow topped mountains on Arran. Blue skies and numb fingers. 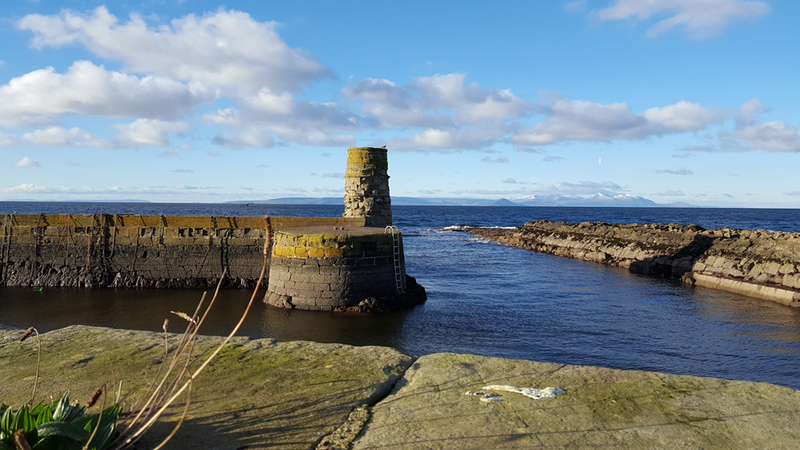 Perfect Dunure.